From the authority of all things bacon. The first in-depth book on America’s favorite fat. Author Ari Weinzweig guides you on a personal tour of bacon's long and curious history. You'll find out why bacon is "the olive oil of America." You'll travel to medieval England, where bacon was used to promote matrimonial harmony. You'll head to the farm and learn about 19th-century drovers who were crucial to the hog trade. Ari's story shows how bacon moved from delicious farm staple to a huge-selling flavorless commodity—and how it's going back to its roots today. There are loads of delicious, well-tested recipes. Oyster + bacon Hangtown Fry for one. And—hold on to your hats, kids—bacon fat mayonnaise. Finally! "Stirs a gnawing hunger for meat." 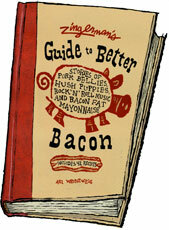 "An essential guide-book for any bacon enthusiast."